Nothing looks better than big guns. In order to make them look big and powerful, you need to pay special attention to your biceps. The good news is that this muscle is very graceful in the way that it grows big quickly. Still, some exercises are better than others. With that in mind, we’ve decided to present you with 6 best exercises for big biceps. The Scott Curl also is also known as the spider curl, It is one of the best exercises for achieving an incredible pump, it will also give your biceps incredible size. 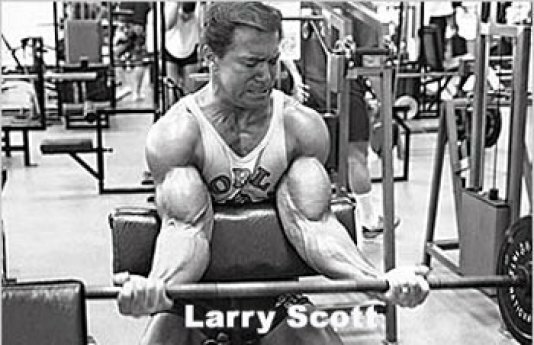 The Scott curl was named after the famous bodybuilder Larry Scott. Don't take our word for it, try this exercise for thirty days and we guarantee your biceps will grow. The Scott curl is a variation of the preacher curl, it is done with a straight bar, this lets you fully extend the arms. 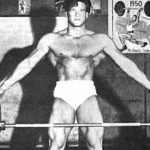 The starting movement is curling your wrists up first followed by the arms this was considered by Larry Scott to be his signature movement you need a lot of wrist strength to perform this exercise properly. We recommend you start out with just the bar and ensure proper form, you can then gradually increase the weight as you perfect the movement. The barbell curl is your number 1 biceps exercise for a number of reasons. It will hit the muscle from several angles, as different parts of the biceps are involved at different stages of the exercise. On top of that, if you perform this exercise correctly, you will not only constrict the biceps but also stretch it, which is the key to the muscle growth. Apart from the biceps, many other muscles are engaged during this exercise. Because you need to hold the barbell tightly, your forearms will be engaged heavily. On top of that, in order to keep the balance, your back muscles and abs will need to work hard. Finally, if you’re doing the barbell curl while standing, you are bound to involve your glutes and quads, as well. While standing, with your back straight, you need to hold the barbell in the underhand grip. In the starting position, your arms need to be extended to the maximum, so that the barbell is almost touching your knees. The next step is to pull the weight toward the chin, using the force of your biceps. While doing it, your shoulders need to stay fixed, while your elbows need to be as close to your body as possible. This exercise is very similar to the one above, with the difference being that you use two dumbbells instead of one barbell. Still, that’s not the only difference – you also target different parts of your biceps. The barbell curl is primarily focused on the lower part of your biceps, while this exercise will make the upper end throbbing. This is because dumbbells allow you to do a curl all the way. 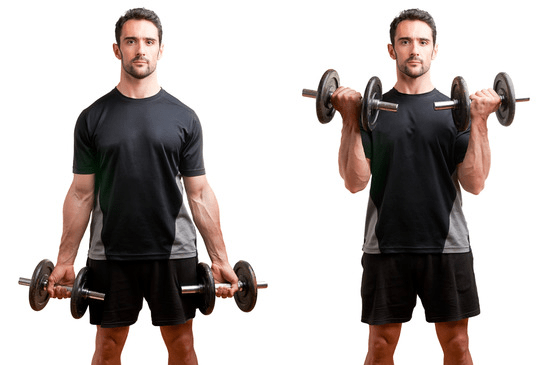 You can even curl the hands toward your chest once you lift up the dumbbells. In fact, this part is what makes the biggest difference with the barbell version of the biceps curl. Not many people use the Smith machine to do biceps workout, but those who do surely have amazing arms. At the first look, this exercise is very similar to the barbell curl. The movement is basically the same, with the difference being that the opposing force is coming from dragging. Although many people believe that the advantage of this exercise over the free-weight curl is that it focuses on nothing but the biceps. The truth, however, is completely different. This exercise will not involve your core muscles and the legs but will make your arm muscles work hard.In fact, doing the Smith machine biceps curl is going to make almost every muscle in your arm engaged. Of course, the biceps will be under the most pressure, but your brachialis, triceps, and forearm muscles will be involved, as well. There are several variations of this exercise, with our favorite being the one that goes behind the neck. This exercise is amazing as it focuses heavily on your biceps. 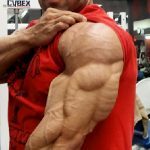 If you keep your shoulders and elbows fixed, your triceps will not be involved at all. Of course, your forearms will also be engaged, as you need to use them to hold the bar tightly. A great thing about this exercise is that it allows you to stretch your arms to the maximum, but also to curl it as much as possible. Basically, this means that you will hit the biceps from all angles. To be frank, this exercise is not meant to be a biceps exercise at all. 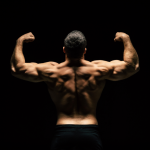 It focuses primarily on your back muscles. However, it also involves a number of other muscles, including your core, but also your arm muscles, most notably the biceps. In order to do the exercise properly, you need to let yourself hanging from the bar in the starting position so that your arms are extended to the maximum. This means that when you start pulling yourself up, the biceps will have to be involved heavily. The same will happen when you try to push your chin over the bar.